Tree-of-heaven (Ailanthus altissima) seeds and foliage, Chuck Bargeron, University of Georgia, Bugwood.org Snapshot : Ailanthus is an aggressive non-native invader of mixed hardwood forests, where it can outcompete native vegetation, including both trees and other plants. Forest Service scientists are testing a native wilt fungus as a biocontrol, but managers also want to know how long the seed persists in the forest floor after seed source trees have been removed. 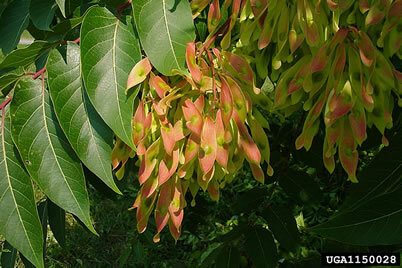 The exotic tree species Ailanthus can displace native trees and other plants when it grows in the mixed hardwood forests of the eastern United States. In addition to field tests of the effectiveness of a native fungus as a biological control for Ailanthus trees, research also includes tests of the effects on non-target species and tests of the longevity of Ailanthus seed in the forest floor seed bank. These tests involve collecting seed that is fresh and storing it where it can’t germinate for varying periods of time. Each year, a subset of the seed that was collected at the beginning of the experiment is exposed to ideal conditions for germination. Now, at year 6, the seed bank tests are drawing to a close. Through the first 2 years, 82 percent of the seeds germinated each year. By year 6, more than 60 percent of the seed that had been buried under 10 cm of soil, then brought to surface as they might be in a disturbance, are still able to germinate. This gives managers knowledge on how long they must continue to monitor sites from which Ailanthus seed bearing trees have been removed in order to protect native vegetation.